Disclosure: I received a bottle of this product to facilitate my honest review as part of the Purex Insiders! No monetary compensation was received! All thoughts and opinions stated are those of the Shelly's Bits & Pieces Family! NEW Dial® Coconut Water Refreshing Mango body wash brings hydration to your body washing experience in a tropical fun new scent. Kat was thrilled when this body wash arrived. The scent is out of this world. I love the scent of coconut, and although I am allergic to it and cannot eat it, I can certainly use it in body wash. We love that this body was did not leave our skin feeling tight like some body wash does. We really did feel refreshed when we used it. 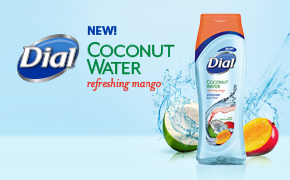 Out of all of the body washes we have tried, the Dial® Coconut Water Refreshing Mango smells the best. Nothing reminds me more of summer than coconut...toss in the mango and I am in the tropics! Want to give it a try for yourself? Simply enter on the rafflecopter form below! Two lucky Shelly's Bits and Pieces readers will each win a coupon for a free bottle. I love floral scents especially jasmine! I like vanilla scented or shea butter body wash the very best. I love anything that smells fresh, and I definitely prefer fruity scents to floral ones. coconut is right up my alley. I love vanilla the best.